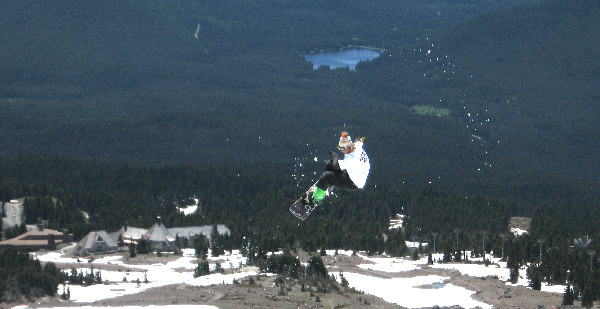 One Summer many years ago, my best bud Jason and I went to Mt Hood to snowboard ‘camp.’ We stayed at Rebel Lodge, which on paper sounded as good as the continental breakfast, dry-land training, gate training and half-pipe sessions we greedily read about in the pages of our snowboarding mags. When we arrived in Oregon, we were picked up at the airport by a hung-over driver who insisted on making a pit-stop to chug a few Bloody Mary’s. Afterwards he took us to his drug den so he could ‘get some stuff’ before finally heading back to the airport to pick up one last ‘camper’ from California and heading to the lodge about an hour and a half away. Rebel Lodge, we discovered, was a simple cabin in the woods of Government Camp. While the plumbing didn’t work and there was a problem with infestation in the bunk room, there was a mini pipe set-up in the back and the outside walls of the cabin were lined with demo boards from every manufacturer of that time. We had our choice of Barfoot, Crazy Banana, Sims, Burton, Kemper, Avalanche, to name a few. We walked through the doors of the lodge and were met by a haze of pot smoke. Making our way to the bunk beds in the back of the cabin we walked past and over people watching at snowboard videos, reading industry mags, tuning boards and talking shop. Some of these guys looked familiar I thought. Yes, many were pro riders I was just reading about that morning on the plane. The next morning we woke up for continental breakfast but were instead instructed on how to slip a tapered Yoplait yogurts into a glove at the local market and then make a run for it (dry land training?). On the mountain we ran gates, free rode and then, after one last run to salt the glacier, we made our way down to the half pipe to rip for hours with the likes of Chris Carol, Kris Jamieson, the Papas brothers (George and Chris), Dave Estes, Sonny Miller, Don Szabo among other great riders of the time. We would kill it in that pipe for hours, cheering each other on and discovering new tricks in just weeks, what would normally take years. After heading back in a car with faulty brakes, we would party; either at the lodge or by a huge bonfire along Hood River. We had little success persuading the local girls to come to ‘Chateau Rebel’ – the reputation was too well established. Clearly this trip was not what we signed up for – it was way, way better! I probably forgot more about snowboarding than I’ll ever learn at this point, or I simply don’t have the balls to try as much. It’s been said there are old pilots and bold pilots, but no old, bold pilots. If you ever have a chance to do some Summer riding check out Hood, BC, Chili or, for the truly adventurous, New Zealand.